Speakers and guests discuss blockchain technology prior to presentation. Blockchain, a technology underlying Bitcoin, has been heralded as a disruptive technology with widespread applications in sectors such as finance, insurance, logistics, supply chain, and mobility. Big name financial firms, banks, insurance companies, federal agencies, foreign governments, auto manufacturers, and startups are exploring blockchainâs potentials in their respective domains. One of the sectors that has widespread use of blockchain is logistics and supply chain. IBM, Maersk, and Walmart, among others are working on blockchain based solutions to solve multiple challenges in supply chain. 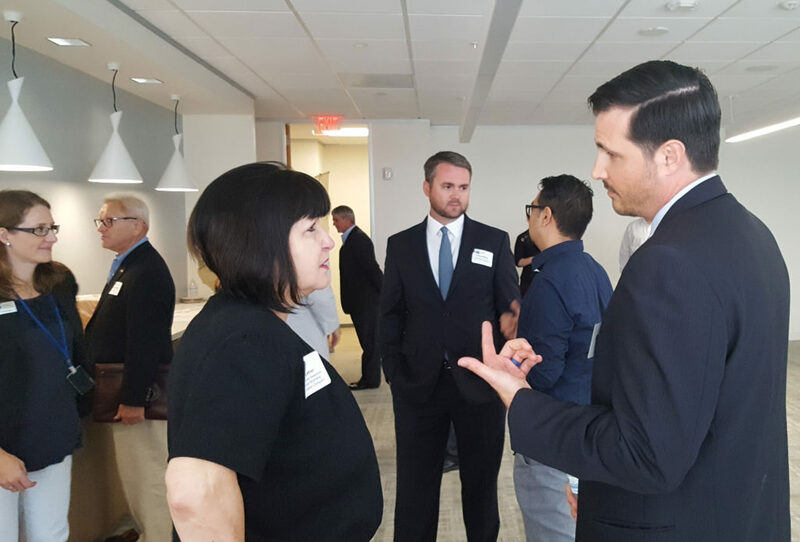 That is why, yesterday, the German American Chamber of Commerce of the Southern U.S., Inc. (GACC South) and the German Logistics Association âBVLâ held its first joint Logistics Roundtable, with Blockchain technology as the topic for discussion. 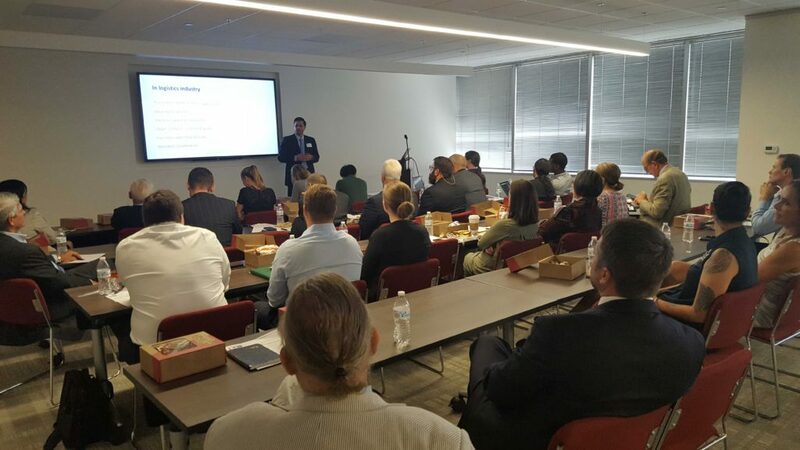 “We provided this roundtable discussion because itâs important that we offer opportunities for our members to learn about, and discuss, relevant topics related to the transportation and logistics industries”, said Maret Petersson, Membership Manager for the German American Chamber of Commerce of the Southern U.S., Inc. The roundtable discussion included Rajat Rajbhandari, PhD, Texas A&M Transportation Institute and Dustin Hebrank, Chief Financial Officer, Gulf Winds International. Dustin Hebrank, Chief Financial Officer, Gulf Winds International, discusses how blockchain technology can be utilized in transportation/logistics industry.